Basic Ingredients: Kooky cook Marika Gauki is an Anglo-Greek former punk whose band enjoyed brief success in the US. Now she runs a morning cookery class out of her own kitchen for £60 focusing on sweet and savoury picnic snacks. Students learn how to rustle up bite-sized treats such as mini-beef pasties, feta cheese tartlets, sun-dried tomatoes, tabouleh, orzo pasta salads and cakes. Small class sizes of up to five people make this hands-on and intimate. We Say: Genius. Pitch up at an ex punk’s North London pad with an empty hamper and then head for Hampstead Heath having been taught how to fill it. 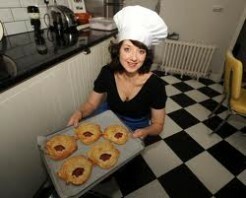 Book early for Marika’s Sunday Pie Making Club held at a bakery in Muswell Hill on the first Sunday of the month. I was totally inspired by Marika’s class and have been addicted to making pies since! I came to Marika’s cosy north london flat nursing a sledgehammer of a hangover but I left reinvigorated and enthused that Saturday morning. She’s affable, jovial and always on hand to share tips and tricks while she sings along to her iPod jukebox of jolly jams. Since rustling up those delicious steak & ale pies (one of which I mailed to my big-eating brother for his birthday – he certainly approved) along with a tray of the apple variety for pudding, I’ve progressed to dark chocolate, ginger and raspberry cheesecake, beetroot and horseradish tart and boozy mixed nuts brownies. I highly recommend that you book a visit to Marika’s kitchen. Preferably not on a hangover though! We love Marika and her cookery classes! I have done a couple, including the Pie Class, and have recently booked another class with some friends from work. We’re looking forward to lots of laughter and story telling, new recipes, singing along to the ipod and enjoying cooking together in Marika’s fabulous kitchen. Can’t wait! I had a brilliant time at Marika’s. She’s very friendly, unpretentious, laid back and a huge enthusiast for what she does. She has a real knack for inspiring confidence and hands out advice, guidance and tips without ever making you feel you were doing it wrong up until that point. The big difference though was the amount of confidence and knowledge I gained. I have done a number of cookery classes before and only ever really used the precise recipes given at those classes. At Marika’s I have learnt a skill which I have been able to reuse, to experiment with and which has totally changed my cooking. Friends and family I have since cooked for have been hugely impressed. We were lucky enough to be given our pie making lesson with Marika’s Kitchen by a friend for Christmas. We didn’t quite know what to expect and were feeling both excitement and apprehension (first time ever to have done a cooking course). As soon as we arrived, this friendly face met us at the door and took us through to her comfortable and trendy kitchen. The chat began and it was like we had been friends forever! There was a real sense of homeliness and warmth instantly that we both really loved. We were kept topped up with refreshments and the chat continued to flow. The lesson itself casually started, with Marika remaining relaxed, enthusiastic and thorough the whole way through – it was quite simply brilliant both on a technical and personable level. If you’re thinking about booking, don’t hesitate – do it, she is very, very good!